In our ideologically polarized world, one thing that two sharply-contrasting groups militant fundamentalists or atheists, on either end of the theism and atheism spectrum, is an extremely facile grasp on history. Facts merely become an easily domesticated, tamable beast, to some members of both these groups, who feel that history should be expunged of complexity and paradox, for the sake of the conservation of coherent rhetoric that can easily lead more lightly-defended minds under their influence. Often discussions about “religion” are almost always correlated with “violence,” by some militant atheists, who haplessly believe that the totality of religious history demonstrably proves that religion is the singular source of violence in the world. Defying the more complex findings from more sober information sources like psychology, history, and anthropology, the militant atheists will often depict an Utopian scheme or idealization of the world, existing freely of religion, or any things they see as barbarous neuroses of the human psyche. Somehow, they think the ultimate solution to the world’s inveterate violent lifestyle lies with the complete and utter annihilation of religion from world, magically siphoning out all the greed, misdeeds, and moral complexity of humanity along with it. In the same vein, religious fundamentalists depict a world, where their heavily politicized, fatalistic view of the world, would help spare the world violence, by bringing peace through ideological homogeneity of strict religious belief. Fatalistically, Christian Fundamentalists see themselves as being in some type of perpetual insurrection, against the forces of secularization or modernity, who they see as abolishing or outlawing their religious views. They become fanatical, because they are always acutely aware that they are at war with the modern world. They often use sneaky rhetoric, which says much the same thing as the seemingly antithetical view of the militant atheists. They believe that anything other than strict, rigid, unflinching adherence to heavily politicized views of their religious dogma will somehow create a blighting apocalyptic scenario, as secularization of the modern world is something that inherently causes the undeterred wrath of God to spill out into the world. It is the unsparing freedoms of complete democracy, which they seem as being too irregularly liberal for their rather small-minded, prejudicial God (that ironically is unable to handle the trauma of modernity, as much as Fundamentalist Christians themselves). Having read a slew of Karen Armstrong’s articulate, well-written religious history books before, I knew that her newest book (being released tomorrow, October 28, 2014) would be just as smartly written and have an abundant amount of clear-headed insights, as any of her other books that have handled the large questions, concerning religion, with coherent ease. I often find many nonfiction writers extremely ponderous, because many of these writers are far too enmeshed with their own scholarly biases, to look outside of their little cozy scholarly trench, and try to scope out the depth and nuance of other views. Within each well-written chapter of Field of Blood, you get very well-cited, briskly-summarized chapters about different ancient cultures and how there is much more complexity, as evident in history, with the question of whether religion is simply the singular source of all violent conflict in human history. For most of the moderate thinkers,this lazy assumption, made by some of the new atheists, is incredibly easy to refute, because any deduction that asserts only one monolithic group is responsible for “all of something,” is an approach that is very vacuous, and completely detached from reality itself. It completely ignores the political influences behind the ways some religions act, entirely adverse to their core spiritual or ethical ideals. One example, from Karen Armstrong’s book, is concerning the chapter about the Israelite, which is a chapter that might bewilder fundamentalists, as Karen Armstrong holds the academic perspective (collaborated by many, many archaeologists, historians, other religious scholars, etc.) that many of the stories of the early Jewish scriptures- especially the Pentateuch- are not literal examples of true history, in the same sense that we recognize history today. If you know anything about the history of writing, you should know many cultural stories at this time were an amalgamation of shreds of truth, with some clever story-telling fabrication, so that the storyteller, or travelling yeoman, that told these stories, had something that would resonate with whatever type of conflict people of this specific culture was facing. These stories were chiefly for catharsis,in the same way that people flock to Harry Potter, and come away feeling euphoric, knowing that the spiritual conflicts inside of their psyches, can sensibly be defeated, or outwitted, because Harry Potter allegorically showcases the psychical battle between the pernicious forces of melancholy and hope/ambition. So, the original Exodus story, about Moses leading the Israelite out of Egypt, far away from the despotic corruption of Egyptians towards the Israelite, was relatable, enrapturing, and above all, spiritually invigorating for the Israelites in the BCE era, where war was common, all due to the combatant tribes and large contingencies of other nations and their armies, who had an interest in conquering and subsuming their land and various economic resources (food; material goods that may have been unique to a specific geographic area). The core conflict, reenacted and recapitulated in all Jewish scripture, is the need to preserve their culture, their specialized form of religious/spiritual practices, etc. Linearly, the early stories from the Pentateuch are a story, describing the different patriarchal fathers of the Jewish faith, telling a coherent, easily assimilated, origin story of the Jewish faith. In reality, Judaism, as known today, hardly resembles the more polytheistic Judaism, which would have included other patron Cannonite deities, that makes it impossible, with today’s scrutiny of corroborated facts and evidence, to be considered true, in the same sense, that the people back then viewed this story. In another sense,with respects to Karen Armstrong’s main thesis in Field of Blood,these scriptures,though, are essentially a political history of the Jewish people, trying to uphold more egalitarian approaches to ethics and the structure of society, in lieu of the reality that larger agrarian cultural forces are really the mainstay element of structure of successful societies back then. Wars, hierarchical marginalization/enslavement, and tedious/mundane labor were ineradicable realities for people back then and even now, because without this very normalized system (that we have evolved to acclimate to), we fear that society would not be able to function. Sometimes, religious interests go enmeshed by stronger imperial interests, because of the way agrarian cultures functioned, and that is why there is a rich, embattled sense of paradox and indecision, with respects to what truly constitutes righteous ethics, in the Jewish scriptures, particularly, because this problem is nigh impossible to solve, and continues into today. Karen Armstrong argues that religion is only part of the bigger historical problem, really, of certain evolved customs of human society, like either warfare, social/economic stratification, being a bitter, disillusioning reality that is part of the agrarian/urban society. Even in our more modern world, we are still living in an agrarian culture, where imperialistic interests (mainly political interests) dominate policy decisions that cause us to go to war. Oftentimes, our religions and ideologies are going to invariably be influenced by the political issues of the day, whereas there is still always a strong battery of more spiritual/mystic groups that try to separate their religions from becoming too politicized. During the time of the Crusades for example, we saw religion being used as a primary force to compel people into joining the crusades, religion thus becomes a tool to utilize to motivate, cajole, in some sense, rile people up till they’re in the right mindset to go raging into war. Before the new atheists solely blamed religion, Machiavelli shrewdly devised the theory that religion is often used by rulers, in order to really help with making political policies more palatable to the masses. The war in Iraq, engineered by the Bush Administration, was only retold as a religious meta-narrative, to certain ideological groups in this country, to feel that ridding the world of Saddam Hussein would be helping in eliminating the pestilence of terrorism that threatened both our country, but the psychological sense that our country is divinely favored by our most coherent sense of God. In some sense, the current Christian fundamentalist obsession with homosexuality, is mainly a conservative, political one, borne out of a mythic view that the aggrandized, Utopian scheme of America in the ninety-fifties- which in truth were not simply those halcyon “good ol’ days”- was when America enjoyed the splendors of economic prosperity. With some naturally-occurring economic problems in today’s country though, the fundamentalists fear that homosexuality distracts Americans from the ideal of marriage, reproduction, and replenishing the population with more of their assured homogenized progeny, which reveals that the very thing belying this insistent, frantic fear over homosexuality, is really part of a wider subconscious fear of rapid modernization, and even growing racial diversity in the world. Religion gets pulled in, as though to give the whole thing an inerrant religious polish. Biblical scriptures, plucked with disregard to their true historical origins, get thrown in, in desperate attempt to despoil the liberal message, with messages that carry the clarion of what fundamentalists believe is divine messages from God himself. Again, the true underlying motivation for this obsession is mainly political, but religion and any other fragments of information pulled from other favorable sources are used to create an illusory message of ideological coherence. The fact that there are nearly 39,000-40,000 Christian denominations is proof enough that Karen Armstrong’s thesis is strongly supported, in that the political atmosphere or climate, or what is commonplace in the social structure of society, is what really helps bend and shape the strident religious forces in any nation, throughout history. She does add that religion can contribute to violence, as anything can theoretically be used to promote violence, as long as it is part of a larger, coherent message that promotes a ideological interest, or the interest of a state or nation, to motivate a strong political force in the country to agree to a certain political policy. Karen Armstrong’s book could have easily been long-winded, and muddled with ridiculous verbiage and convoluted arguments, but yet it is startlingly clear and resolutely moderate (and even objective) in its approach to the history of the development of certain nations, along with the depiction of how religion gets easily molded into something different by the individual or government using it for ways to add a splash of coherence and resonance with whatever message or political policy they’re trying to support. Religion, like anything in our social structure, is uniquely complex, and it cannot be reduced to being a caricature that ridiculously is portrayed as the source of all human evil. In a sense, that is only part of the trend of creating alibis-the shadowed other, the aberrant enemy- these things are more strongly influenced by our agrarian social structure, more than even religion. The things that we call primeval or base desires-like greed, envy, violence- are psychological realities that exist somewhere in our subconscious, or in the reptilian parts of our brains (referred to as the ID) that can greatly influenced the more sophisticated messages dictated by our superego. Our goal is to look more within the psychological grey territory of our ego, where there is more sober deliberation over everything. This is where we truly need to perceive the world and its slew of issues, in a way that vigorously demands acknowledgement of the wider scope of complexity with these issues. 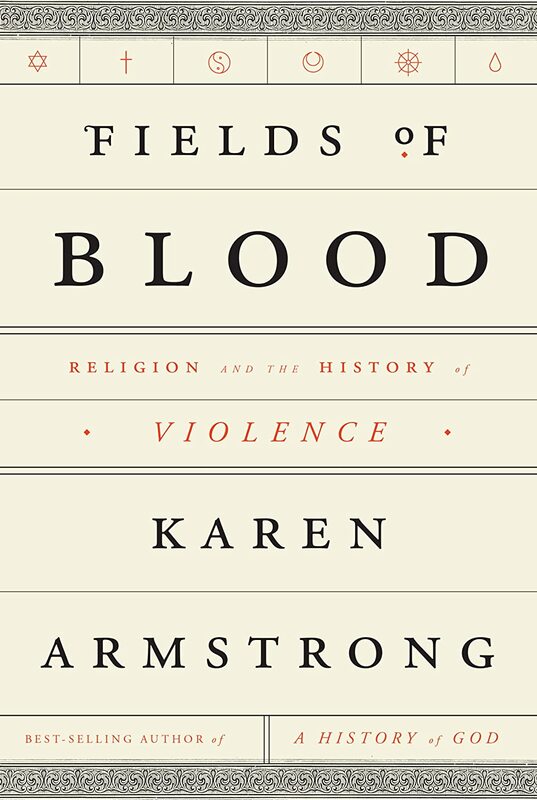 Sobering and impressive in its academic scope and coherence, Karen Armstrong’s Fields of Blood is the history of religion and its complex psychological relationship with the social and political structure of different cultures and nations. It is a book for the observers, the seekers, and the overall disinterested observers of the ridiculously complex world around us. Books, like Fields of Blood, remind us that there are still scholarly books out there, not written with a decisively annoying, restricted ideological bias that implies that there is only one ideologically-pure way to look at an issue. With something as dynamic and complex as religion, we cannot afford to be sticking with only one way of seeing everything, but trying instead to circumspectly analyze everything through a more disinterested lenses, undaunted by the reality that your views about something will be altered, but will probably only deepen. And, my own approach to religion and it’s complex relationship with violence and politics sure did deepen, after reading another wonderfully articulate, thorough examination of the issue, in Karen Armstrong’s fantastic book: a book geared towards the vigorous, serious thinker of such divisive issues like religion and the history of violence. Next Post Review of Prince Lestat, By Anne Rice:Special Midnight Review Post! !